May we serve you a nice cup of tea? 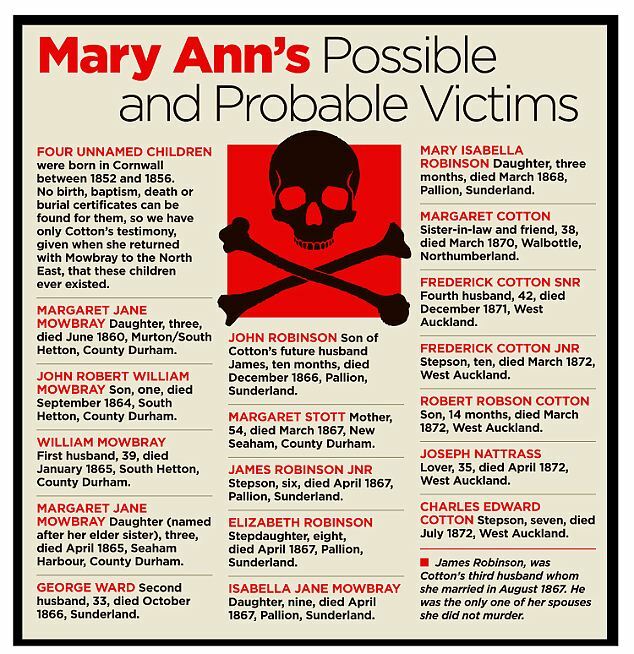 Imbibe, as long as the beverage isn’t being served by Mary Ann Cotton. 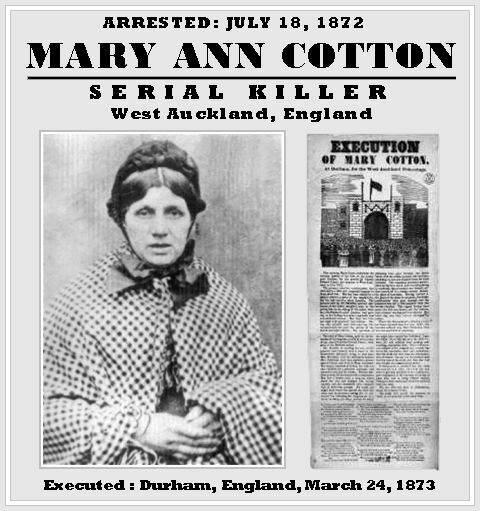 Inspired by the book Mary Ann Cotton: Britain’s First Female Serial Killer by noted criminologist David Wilson, the PBS program Dark Angel (PBS Distribution) dramatizes the events that drew a troubled woman ever deeper into a career of casual murder, while her loved ones and friends, who were also her victims, never suspected a thing. Joanne Froggatt, who stole the hearts of millions of viewers as Anna, the loving and resilient lady’s maid on Downton Abbey, stars in a totally different role in the spine-tingling two-part drama. Dispensing death from the spout of a warm teapot, Froggatt plays the notorious Victorian poisoner. A Golden Globe-winner and three-time Emmy nominee for her Downton Abbey performance, Froggatt is joined by an exceptional cast, including Alun Armstrong as Mary Ann’s stepfather, Mr. Stott; Thomas Howes as her husband number two, George; Jonas Armstrong as her longtime lover, Joe; Sam Hoare as husband number three, James; Laura Morgan as her best friend, Maggie; plus additional actors playing other husbands, her many children, and the few citizens who suspect that something is not quite right about Mary Ann. 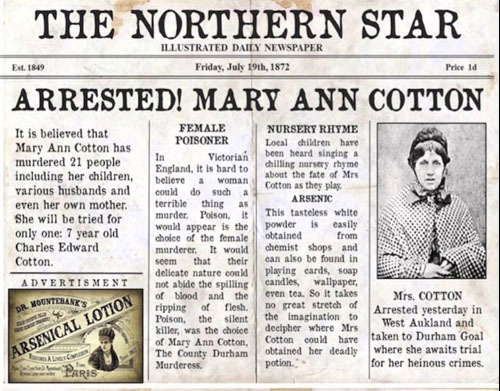 Born in North East England in 1832, a child of the coalfields, Mary Ann Cotton grew up in poverty with the dream of escaping the hard life of a miner’s family, a goal she came tantalizingly close to achieving. Her chosen means were her good looks, sexual allure, and the dirty secret of nineteenth-century suspicious deaths: arsenic, which is tasteless and easily disguised in a cup of tea. A willful king . 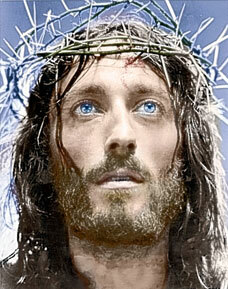 . . a prophetic ghost . . . family betrayals . . . revenge! It sounds like a play by Shakespeare, but it’s a drama about the future. Masterpiece presents an adaptation of the Tony-nominated Broadway show King Charles III, starring the late Tim Pigott-Smith as Prince Charles after his accession to the throne, sometime in the years ahead. King Charles III, a co-production with the BBC, will be available on DVD June 27. The program will also be available for digital download. Daringly scripted in blank verse by Bartlett and directed by Rupert Goold King Charles III focuses on the crisis-strewn transition of power after the eventual death of Queen Elizabeth II, currently the longest-serving monarch in British history. For his part, Charles is the longest heir-in-waiting ever, and Bartlett envisions the turmoil that rocks the monarchy when his turn finally comes. Also starring are Oliver Chris as Charles’s heir, Prince William, Duke of Cambridge; Charlotte Riley as William’s bride, Kate; Richard Goulding as Charles’s younger son, Prince Harry; Tamara Lawrance as Harry’s love interest and self-proclaimed revolutionary, Jess Edwards; Margot Leicester as Charles’s doting wife, Camilla; and Adam James as the polished British prime minister, Tristan Evans. Shakespeare-lovers will detect echoes of Hamlet, Macbeth, Richard III, and Henry IV, among other of the Bard’s works. They will also revel in the rhythmic music of blank verse—unrhymed iambic pentameter—which captures the natural flow of the English language and which Elizabethan dramatists helped popularize, revived by Bartlett to startling effect. “Uneasy lies the head that wears a crown.” That piece of blank verse is from Shakespeare’s Henry IV, Part II, and it perfectly portrays the hero’s quandary in King Charles III. Mercy me! PBS Distribution is leading fans of great TV to Mercy Street: Season 2, available on Blu-ray and DVD (and as a valentine) on February 14. The program will also be available for digital download. What a small-screen saga! The critically-acclaimed Civil War-era drama takes place in the occupied city of Alexandria, Virginia, where allegiances blur, loyalties shift and the drama intensifies as the scope of the war pushes beyond Mansion House, the former hotel commandeered by northern troops to serve as a Union hospital. 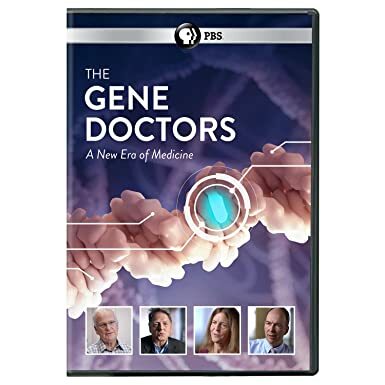 The series follows the doctors, nurses and soldiers, as well as free, enslaved and contraband African Americans and other residents of the war-torn city, as they navigate the new world emerging from the most cataclysmic event in our country’s history. Just how hot is the series? The first season of Mercy Street, that premiered in January 2016, reached a total audience of 14 million people. 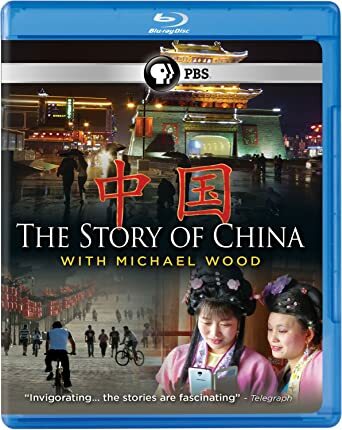 It is the second highest rated drama for the year to date on PBS, after Downton Abbey. The second season picks up directly from the dramatic events at the end of the first season finale, continuing to explore life in the chaotic city of Alexandria, the complicated interpersonal dynamics of Dr. Foster, Nurse Mary and the Mansion House staff, the increasingly precarious position of the Green family and the changing world of the burgeoning black population. The second season will introduce a number of new elements, taking the viewer closer to the war and into the halls of Confederate power, all set against the intensifying war, starting with the Seven Days’ Battle and culminating with Antietam. The new season also delves deeper into the lives of newly freed African Americans, exploring–among other areas–life in a contraband camp, where formerly enslaved African Americans are forced to confront horrific living conditions and disease, but also get a glimpse of freedom. · Patina Miller as Charlotte Jenkins, an educated contraband abolitionist activist who arrives in the first episode. A former slave who escaped to freedom years before through the Underground Railroad, Charlotte (a composite of numerous historical figures, most prominently Harriet Jacobs) offers education to other former slaves and helps with the sick who have contracted smallpox, which was epidemic during the Civil War. · Brian F. O’Byrne as Allan Pinkerton, head of the Union Intelligence Service. 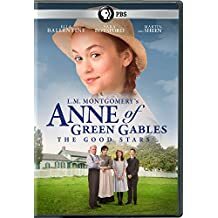 The character is based on the real Allan Pinkerton, a Scottish emigrant and abolitionist who founded America’s first detective agency and successfully brought down some of the country’s most ruthless criminals. ·Bryce Pinkham as Major Clayton McBurney III, the new hospital chief. · Lyne Renee as Lisette Beaufort, a stylish and bold Parisian who has a past with Dr. Foster and creates a stir in the hospital when she accepts a commission with the Union Army in medical visual documentation. ·Chris Wood as Captain Lance Van Der Berg, a handsome young Union captain lodging at the Green home when he strikes up a budding romance with Alice Green, who has ulterior motives for the courtship. · William Mark McCullough as Larkin, a Confederate sympathizer in league with Jimmy Green, who helps formulate a plan to provide rebel fighters with munitions. · Nyambi Nyambi as Caleb, a contraband who arrives at Mansion House Hospital searching for a particular woman. A Downton Abbey fan? That’s number 567,340,027. This holiday season will be the ultimate celebration for those millions. 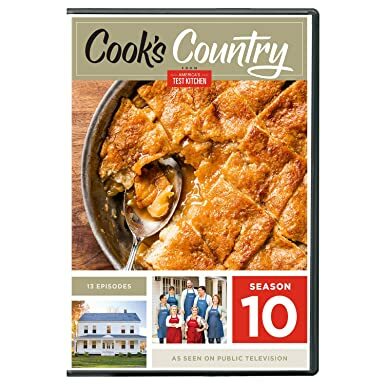 PBS Distribution has released two all-new complete box sets of the series, as well as a stocking full of officially licensed Downton Abbey merchandise. Visit shoppbs.org for deals that will dazzle fans. First we tease you with a clip. How many times have you seen this episode? 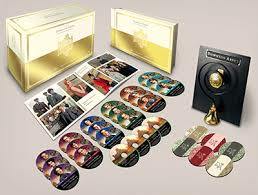 Downton Abbey: The Complete Limited Edition Collector’s Set is the ultimate gift. 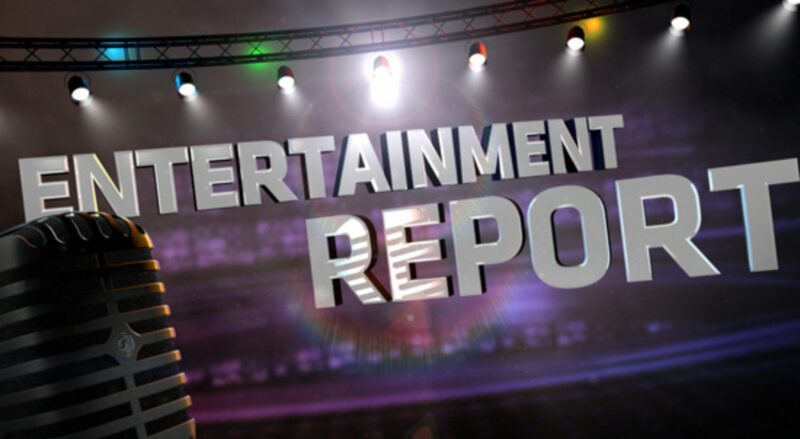 All six seasons–52 episodes–of the Emmy, Golden Globe and SAG-winning program are offered. 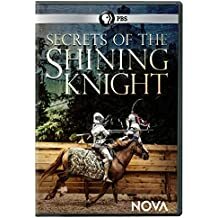 The set contains 13 hours of bonus content including 5 all new hours as well as exclusive collectible keepsakes that lovers of the series will cherish forever. This is the ultimate Downton Abbey box set and a must-have for every fan. The beautiful gold keepsake box contains a working Downton Abbey pull-bell, ready to hang on the wall or stand on a shelf. There’s a collectible set of six elegant cork-based coasters featuring the official Downton Abbey crest. There’s The Costumes of Downton Abbey, an exclusive photo-filled booklet featuring a forward from executive producer Gareth Neame. Then there’s a collectible hardcover book with 22 discs featuring the 52 episodes, including each season finale Christmas special, video extras from each season, full color photography and favorite quotes from iconic characters. 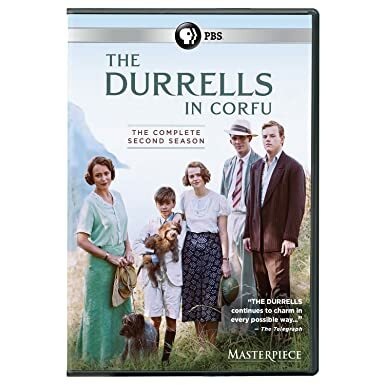 Led by Hugh Bonneville, Elizabeth McGovern, Michelle Dockery and Maggie Smith, the acclaimed ensemble cast brings to life all the drama and intrigue of the inhabitants of Downton Abbey, the lavish English country manor, home to the Earl of Grantham. 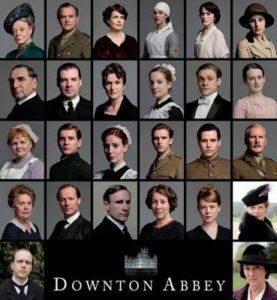 This complete collection set, available just in time for the holidays, includes all 52 episodes of the series of this Golden Globe, SAG and Emmy-winning series, following the Crawley family and their servants through all of the splendor and romance, desire and heartbreak, scandal and rumor that Downton Abbey viewers across the globe have grown to love. 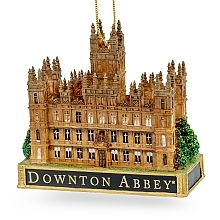 Honor the history and elegance of the grand architectural style of Downton Abbey (actually Highclere Castle) with this beautifully detailed ornament made of high-quality resin that will allow you to enjoy Downton Abbey’s classic style for years to come. It stands 3.5 inches tall. Whether you spent your days upstairs or down, the ringing of bells was a constant sound. 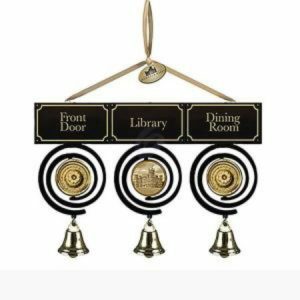 This replica of the trio pull bells used by the family and staff of Downton Abbey will help you ring in the holidays year after year. 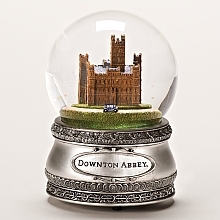 This elegant glass glitter dome features a detailed look at the castle and with the flick of the wrist you can see the magic at Downton. This collectible is perfect for every fan in the family. 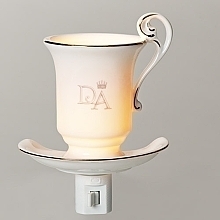 This stylish teacup and saucer night light will illuminate your hallway or any room with its bright LED light and easy on and off switch. It’s the perfect gift for tea enthusiasts and Downton Abbey fans alike.